1969 was a watershed year in America. Richard Nixon took the reigns of the US presidency. It was the year of Woodstock, the Chicago 8 trial, the Stonewall riots and Charles Manson's murder spree. Sesame Street debuted, and the Beatles played their last concert, on a London rooftop. 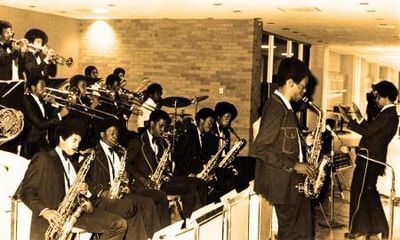 It was also the year in which 52-year-old Conrad "Prof" O. Johnson, a music teacher at Kashmere High School, in a rough section of Houston known as "the Bloody 5th" Ward, shook up the world of school stage band competitions. 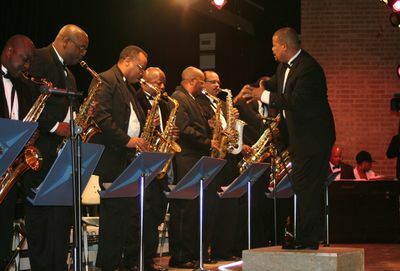 A year earlier, inspired by an Otis Redding concert he had attended in 1967, Johnson set out to transform the sound and style of the Kashmere Stage Band he had been directing. So he began incorporating funk and soul arrangements. The experiment worked. Not only were his students inspired, but they won national awards, played internationally and continued to do so until Johnson retired in 1978. But Prof's legacy didn't end there. The recordings Johnson made of his award-winning stage band found a new audience two decades later when DJ Shadow sampled the namesake track "Kashmere" for a song on Prince Paul and Dan The Automator's Handsome Boy Modeling School CD. Other DJs and music fans began digging through thrift store bins to find the band's recordings. Then, in 2006, the California label Stones Throw reissued a two-disc compilation of the Kashmere Stage Band. An NPR story about that reissue convinced Los Angeles-based producer/director Mark Landsman that he needed to track down Johnson and learn more. "I just turned on the radio and a blast of incredible funk hit me," recalls Landsman. "The reporter came on and said, 'Isn't this incredible? This doesn't sound like 14 or 15 year old kids, does it?' and I said back to the radio, 'No, it doesn't.' Prof came on talking about breaking the color barrier, winning the most outstanding band in the nation--the first time a black band ever did." Landsman immediately went through the Houston phone book checking every Conrad O. Johnson, and the first one he called was Prof's son. "Your father is really inspiring me right now," Landsman told him. "I'm a filmmaker. I think this would make a powerful film." Landsman began his own career teaching film in New York City public schools and has made several documentaries about teenagers. His first feature, Peace of Mind, chronicled a year in the lives of Palestinian and Israeli teens returning home from an Israeli-Arab summer camp in Maine and their struggle to maintain their friendships. In 2001, he directed Books Not Bars, a documentary short about a minority youth group working to keep other teens out of prison. "I struggled a lot when I was that age, trying to find my place in the world--not knowing quite where to fit in," he notes. "So I naturally gravitated towards teaching and filmmaking so I could address those questions." When he was teaching, Landsman was also struck by how difficult it was to get funding for the arts in schools. "To me that felt like a great injustice," he says. "When I was in school, I took access to arts education as a given. Why do the suburbs have art, music, dark rooms, rehearsal rooms? Why do they have access, but not inner-city schools? That didn't feel right, particularly in a country that has such a legacy of arts and music. How do you expect the next Stevie Wonder to arrive? Drop from the sky like Superman? No, it's going to be through a figure like Conrad Johnson. He was the predominant positive force in his students' lives." At the time, Landsman was producing shorts about inspirational Americans for a cable network. He flew to Houston to spend a few days filming Johnson and interviewing some of his former students. "When I met him that first week he was teaching violin to elementary school girls who went on to play at Carnegie Hall last summer," Landsman recalls. "Prof was a very proud man but also humble. He didn't have to wave his accomplishments around. It was enough to know that his band was great. He never hung up his hat and he never swung it around. He just wore it. "We talked about his story and how it would translate into a film," Landsman continues. "Here was this amazing little cool dude who was 90 years old and like 90 pounds. But he had a kind of mighty quality that was immediately apparent. He had a real presence. He whipped out his sax and played a song he had written for his wife. The richness just kept unfolding. It was pretty clear to me he was going to be an incredible person to follow." Landsman worked out a pitch to turn Johnson's story into a narrative film. Through mutual friends, he was introduced to independent producers Keith Calder and Jessica Wu (The Wackness), but they told him they had a full slate and couldn't take on another feature at the time. But when asked if he had any other ideas, he told them he'd learned some of Johnson's students were planning a reunion concert as a tribute to their mentor, and he wanted to make a documentary about it. Calder and Wu lit up and said, according to Landsman, "If we were going to do a documentary, this is the kind we would do." They signed on, but with the understanding they were going to fund it incrementally at first, to see how it developed. With that promise, Landsman telephoned Craig Baldwin, a Kashmere High alumnus who was organizing the tribute. The filmmaker begged Baldwin to move the concert up from that summer to the beginning of 2008, fearing that he'd lose Calder and Wu's backing if he had to wait that long. If the alumni hadn't finally relented and agreed to move up the concert's date--without giving anything away here--it would have been a very different film. Baldwin is a perfect example of Johnson's influence on his students. "Craig could have grown up to be a felon," says Landsman. "He wasn't a thug, he was a wannabe thug--which is probably worse. And Prof caught him breaking into the auditorium just to touch a piano. He wanted to know what it sounded like; he hadn't had any musical training. He was kicked out for breaking and entering, but he wanted to be in the band, and eventually proved himself to Prof. He truly believes he wouldn't be alive today if it weren't for Prof's intervention." "The biggest thing for me," says Gerald Calhoun, who played bass in the Kashmere Stage Band and went on to a professional music career, including playing with Grover Washington Jr. and Stevie Ray Vaughan, "was that all my life I'd been wishing that someone would tell the story of that time. That people would see this is where I came from and the effect Prof had on students like us." Another alumnus, Gaila Mitchell--who went on to become a high school band teacher herself-recalls how Johnson used to joke how someday they'd make a movie about him. She concurs that teachers can and do make a difference: "We can change people's lives--Prof's music lives on through us," then adds, "I had given up teaching before the movie and then afterward I got a call from a high school offering me a job, and I took it." For Landsman, the making of Thunder Soul had an almost predestined spirit in the way all the pieces of the film fell together. "I kept telling the producers I felt like there was another producer involved, like some higher hand [propelling the project forward]. It was a bit crazy." Perhaps the craziest example happened in post-production. Landsman and his editor, Claire Didier ("a huge creative force in this project," Landsman notes), felt stuck because they lacked sufficient visuals to tell their story. "We just had some photos, but no archival footage, no motion pictures," he says. "We thought we were just going to have to piece the story together with creative treatment of the photos." They had called every archival library, every television station in Houston, all without luck. "They either didn't have any material, or threw it out in the '80s, or one said they'd lost some stuff in a fire," he explains. 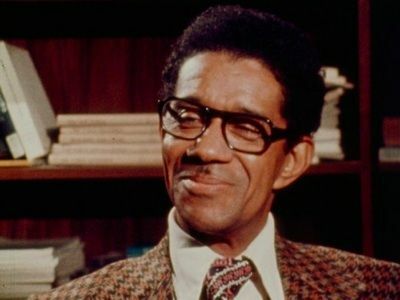 Then two weeks into editing, one of their production assistants called out of the blue to say he was on a set with a guy who back in 1972 had worked with Charles Porter, the first African-American television reporter in Houston, on a 30-minute documentary about the Kashmere Stage Band, and would Landsman be interested in seeing that? "I'm like, Hell, Yeah!" he recalls. Landsman and Didier contacted Porter, who gave them the rights to use his film. "We were blown away by what we saw, and it became the spine of the film," says Landsman. "We had a half-hour of footage and we used maybe every frame of it. Charles was so gracious. When he had first tried to pitch the story at his TV station, he was told no one would care about some black high school students, but he took it upon himself to do it anyways." Thunder Soul premiered at South by Southwest in 2010 and won the Audience Award. After the premiere, there was a live performance of the reunion band. As the film began to garner attention, including Audience Awards at Hot Docs and Los Angeles Film Festival, and a 2011 Spirit Award nomination, actor (and Texas native) Jamie Foxx stepped in as executive producer to help provide the film a theatrical release. Foxx said in a statement earlier this year: "I can't wait to share Thunder Soul with the world so that everyone can enjoy this one-of-a-kind experience. It's such an entertaining and inspirational story that touches your soul and awakens the human spirit in the way that only love and the power of music can." In a 2006 interview, Johnson said, "My goal was to help the children understand. I had a chance to witness jazz when it was in its infancy. I had the chance. I wanted to spread that joy to the kids I taught." And now the film of that accomplishment is set to "spread that joy" to audiences worldwide. Thunder Soul opens in theaters September 23 through Roadside Attractions.